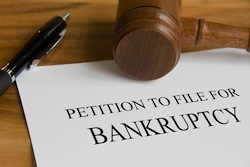 What is Bankruptcy and Do you Need to File? At the Oakland Law Offices of Melanie Tavare we understand the overwhelming feelings of being in too much debt. We have clients come into our office everyday with crushing amounts of debt. These clients have taken their first steps toward financial freedom by getting started with the bankruptcy process. Thought by many as a last resort, bankruptcy in reality is a fresh start set up by the government to help consumers like you get back on their feet. When you file with the right bankruptcy attorney you can feel immediate relief from the financial stress that follows you around every day. In this day and age not everybody can make ends meet with the wages they are paid. It can be especially challenging in high cost areas like Oakland and the San Francisco Bay Area. With the rate of inflation and lower wages across the country it is no wonder that more and more people are turning to bankruptcy for a way out of debt. So what is bankruptcy? In a nutshell, it is a process set up by Uncle Sam to discharge certain kinds of debts. There is unsecured debt such as credit card debt and medical bills and there is secured debt such as car and mortgage loans. With a bankruptcy lawyer you can pay a small price and potentially discharge thousands of dollars in debt and get your life back on track. For consumers and small business owners there are two types of bankruptcy available: Chapter 7 and Chapter 13 Bankruptcy. Which one you file will vary depending on your unique situation. The most common bankruptcy is a Chapter 7 which is a complete liquidation of unsecured debt. A Chapter 13 may be filed by someone who is trying to save their home or is trying to hold on to certain assets but still discharge a percentage of their debt. You may also file Chapter 13 Bankruptcy if your income is too high for a Chapter 7. Although, some debt may not be discharged such as child support or certain taxes, getting rid of your unsecured debt will certainly give you the opportunity you need to get back on your feet. Filing bankruptcy may be right for you if you’re thinking about your debt everyday and you’re not sure how you are going to repay it. If you are struggling to make the minimum payment on credit cards you may want to consider a free consultation with a bankruptcy lawyer. If you have debt collectors calling non stop, garnished wages, bank levies, or lawsuits you may also want to consider filing bankruptcy. During a free consultation with an honest bankruptcy and CA bank levy attorney you should get the advice you need regarding bankruptcy and its alternatives. Hire a bankruptcy attorney with the experience you need to get out of debt. Call today for a free consultation. Weekend appointments are available.